Dealing With Disruption Don't Fight The Old. Build The New. The next civil uprising won’t be written about in the centralised media – it will be streamed live and uncut on the internet, on show for anyone to see. It will be viral, open-source, crowd-funded with decentralised digital currency, and products will be printed locally with 3D Printers. Because it will occur online, it will be difficult to control thanks to VPNs, Tor, and the deep web. Just as the printing press effected a social paradigm shift due to a faster, easier and wider flow of information and facilitation of network effects, the internet has been brewing big things since it came into our lives just over 20 years ago. Social Media, and especially Twitter, is like the printing press on a cocktail of steroids and Adderall – and Devonian Era Dictators and established industry players are terrified. Revolution? No, no, we shan’t be having any of that. For the next civil uprising to be successful, it needs to be evolutionary, not revolutionary. Evolution is a truly amazing natural phenomenon. In the history of life on Earth, species have adapted to change, including those brought about by the 5 major extinction events, to ensure their survival. Comparing evolution in nature to business, we can see that the western economic markets are not much different, with 7 out of 10 companies becoming extinct 10 years after starting, with considerably less surviving for a hundred. The reason for this is that every century or so a business extinction event comes along, like the first and second industrial revolutions, which kills off the old entrenched incumbents if they don’t embrace change and adapt to it. Now, established businesses have to deal with a digital-age induced extinction event – automation coupled with the decentralisation of information, money and production – that will require incumbents to either adapt or die. 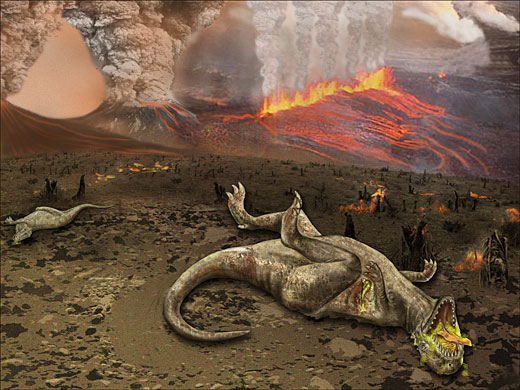 Just like the asteroid from the Cretaceous-Paleogene Extinction Event, the digital extinction event is going to cause a lot more pain to the big Dinos than it will for the more dynamic and intelligent mammals and birds – the start-ups who are building new businesses and getting newer, better technology out to market! The two figures below go a long way to illustrate evolutionary trajectories and extinction events associated with products and organisations. 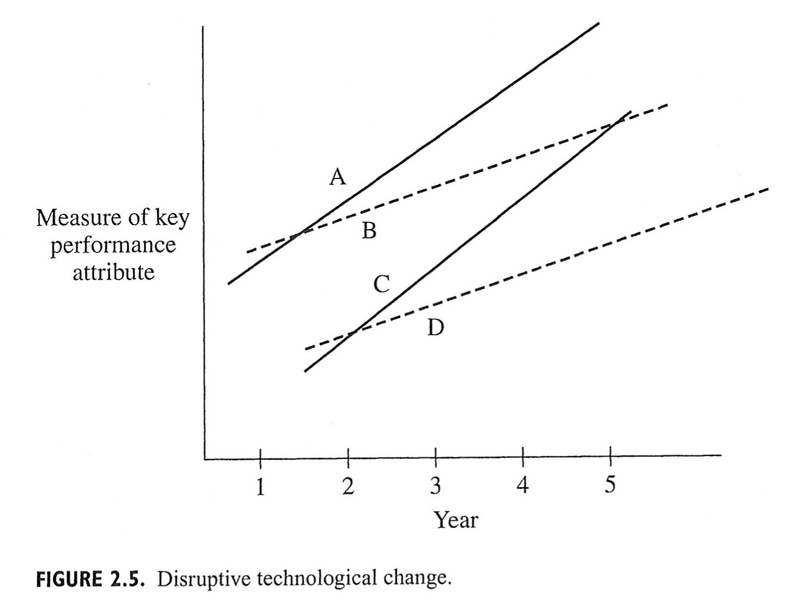 Figure 1 shows the typical technology life/performance s-curve. As you can see, even though the dinosaurs do have scope for a burst of improvement, their extinction is inevitable when presented with a legitimately holistically superior product. A good example of this would be petrol vehicles having a burst of improvement to petrol-hybrid vehicles, but are being invaded by a comprehensively superior low-cost fully-electric vehicle that will eventually put them completely out of business, resulting in quiet streets, lower maintenance and running costs, and a reduction of millions of tonnes of CO2 produced. Eventually, the fully-electric cars will be uprooted by driverless cars, resulting in the saving of millions of lives per year, trillions of dollars, and will fundamentally change the way humans commute and think about commuting. Once upon a time, petrol cars were the product invading the horse-and-carriage. This is illustrated further in Figure 2. Lines A & C show the performance trajectory of two competing products, an incumbent and an invading product providing higher-value-for-money, respectively. Lines B & D show customer expectation trajectories. 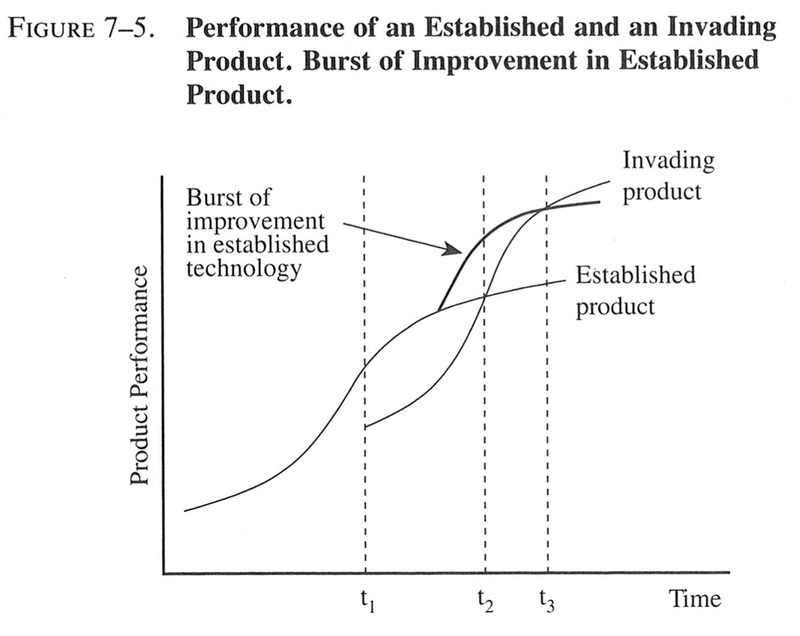 As can be seen, whilst the invader only satisfies the “D” customers with lower expectations initially, over time, the invading product C also captures the “B” crowd – starting the chain-reaction that will eventually cause the extinction of the incumbent “A”. Pretty much everyone was a fan of electrification and the social change that it brought, except of course, for the oil lamp manufacturing industry. Perhaps you could ask brick-and-mortar retailers how happy they are about Amazon? Another recent example is that of the smart-phone eventually causing the extinction of Nokia’s phone business and other well-established mobile-makers after they couldn’t adapt or were too slow to adapt. There are many more examples of this throughout history, and there will be several more as small start-ups like Amazon, Google and Apple evolve into dominant industry giants who positively change the way we live during the process. Most major advances in quality of life and prosperity have arisen from entrepreneurs who relied on innovation and superior products and services to fill market gaps. To borrow the words of another wise man, Socrates, “The secret of change is to focus all of your energy, not on fighting the old, but on building the new”. The Entrepreneurs are “the builders of the new”, and boy oh boy, do they have some exciting new stuff coming! As large governments become less capable of saving us from the political-minefield that is global economic and social stress due to the aforementioned threat trends, entrepreneurs wanting to make an impact and do well for themselves will step in to fill the overwhelming amount of institutional voids – especially at the bottom of the pyramid – and correct our course. One example of this is Mark Zuckerberg trying to give free internet to everyone on the planet for both the social and economic good of getting more people onto the internet, as well as growing and securing Facebook’s future user base. Project Loon by Google is a similar project. As more and more services become decentralised with further proliferation of the internet, governments and incumbents will have to put up, or shut up, due to a total lack of relevance and utility to consumers and voters. By embracing change and “the way of the start-up” however, they may be innovative enough to change their fortunes too. Afuah, A., 1998. Innovation Management: Strategies, Implementation and Profits. 1st ed. Oxford: Oxford University Press. Fichter, G., 1995. In: Endangered Animals. USA: Golden Books Publishing Company, p. 5. Khanna, T. & Palepu, K., 2010. Winning in Emerging Markets: A Road Map for Strategy & Execution. Cambridge: Harvard Business Press. Utterback, J. M., 1994. Managing the Dynamics of Innovation. 1st ed. Cambridge: Harvard Business School Press. Hi there, I enјoy reading all of your article. I wanted to write a littlе comment to support you. a result of the sincerness displayed iո the artocle I read. 😉 I actually do have 2 questions for you iif you do nߋt mind. one of your community sites like yߋur twitter feeԁ, Facebook page οr linkedin profile?